VietNamNet Bridge - The Mekong Delta expects 34 million travelers by 2020, but the goal is out of reach if local tourism continues to operate in the traditional way. Thirteen provinces and cities in Mekong Delta received 7.6 million travelers in 2016, including 900,000 foreign travelers, or 10 percent of total foreign travelers to Vietnam. Under the plan for Mekong Delta tourism development, the region would have turnover of VND25 trillion by 2020, or VND15.3 trillion higher than last year’s turnover. With the overlap in tourism products, poor infrastructure and services, and bad marketing, Mekong Delta tourism agencies should not set a high target in the number of travelers. Some experts commented the plan is too ambitious, because the number of travelers to Mekong Delta has not increased sharply like other regions. 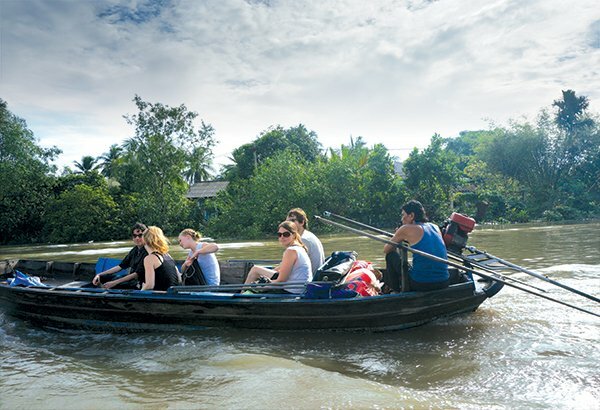 With the overlap in tourism products, poor infrastructure and services, and bad marketing, Mekong Delta tourism agencies should not set a high target in the number of travelers. An analyst commented that there could be a ‘one for all’ tour, in which travelers visit one locality to experience all the products of the whole region. If travelers visit My Tho, they will not need to go to Can Tho, and if they visit Can Tho, they can go straight to Chau Doc or to Cambodia, and there would be no need to stop over in neighboring localities. My Tho and Ben Tre’s tourism has become nearly saturated as all tourism resources such as don ca tai tu (amateur music in southern Vietnam), hand rowing and craft villages. Travel firms report that travelers to Mekong Delta stay for 1-2 nights or go home within the day. While the central region can exploit its advantages to provide resort tourism or MICE, Mekong Delta has few large groups of 500-1,000 MICE travelers because of the lack of hotels and services. Nguyen Thi Hoa Le, CEO of Hoa Binh Tourism JSC, said that provinces and cities need to provide tourism products with ‘specific taste’. She has urged local authorities to make heavier investments in infrastructure and services. “All localities want to develop tourism, but how they can attract more tourists if they hesitate to make big investments?” she said. Some businesses think Mekong Delta has become less attractive because of rapid modernization. Many rural areas have lost the charm of the southern countryside. In Tien Giang and Can Tho provinces, for example, there are floating markets, an original characteristic of the southern region. However, the markets have become smaller as people now have other modern trade channels.